Unusual and humoristic 19th French Majolica jardinière with insects playing musicals instruments. Decorated with leaves and flowers. Majolica jardinière in a gondola shape with a masks on the two sides signed Sarreguemines number 1972, circa 1880. Large Victorian colorful Majolica hanging planter Minton, circa 1860. 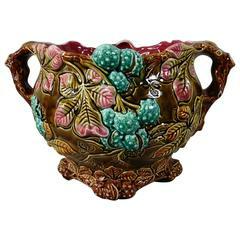 19th Majolica chesnut handled jardinière signed Onnaing. 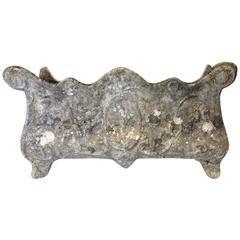 This jardinière is inspired by the Art Nouveau and the Naturalism movement of the end of 19th century. Majolica yellow and brown glazed jardinière with lion paw feet, of gadrooned form raised on three paw feet, 19th century. Measures: Height 9 1/4 in., diameter 16 in. 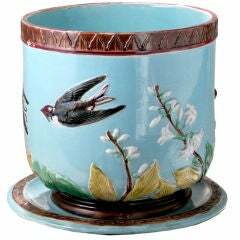 Large Majolica jardinière or planter with flying black bird and white orchid flower on a turquoise ground. Matching underplate has key pattern border. Attributed to: Holdcroft. 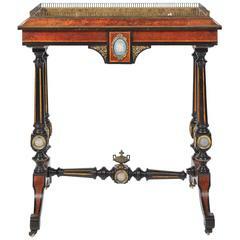 A good quality English 19th century amboyna, ormolu-mounted floor standing jardiniere with wedgwood plaques.